In the current economic climate Chameleon has come up with a way to help you grow or start your online business. If you already have a website you can still take advantage of this offer as we can upgrade your existing website design. 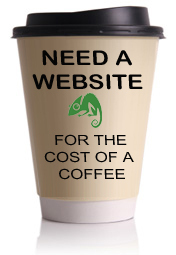 If you are looking for a website but cannot afford the initial cost then Chameleon have the answer as we are offering website’s with the costs spread monthly. We build website with built in Content management systems (CMS) allowing you to upload your own information and pictures. We can include galleries to show your products and all this is part of the same cost. All websites include hosting and we help you obtain a domain name if you require assistance.